Taylor is apparently either very excited or very scared at the prospect of getting his picture taken. 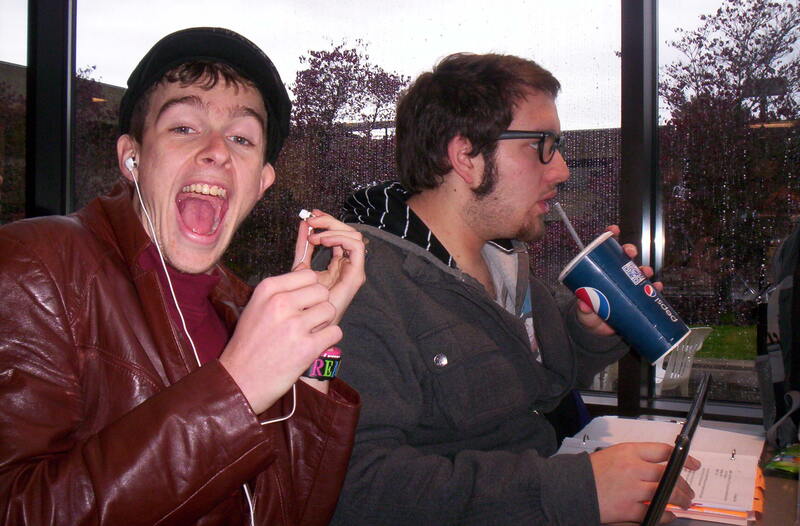 Or maybe I caught him at the precise moment when his music was too loud, seeing as how he has removed an ear bud. Alex is drinking something. Fascinating. 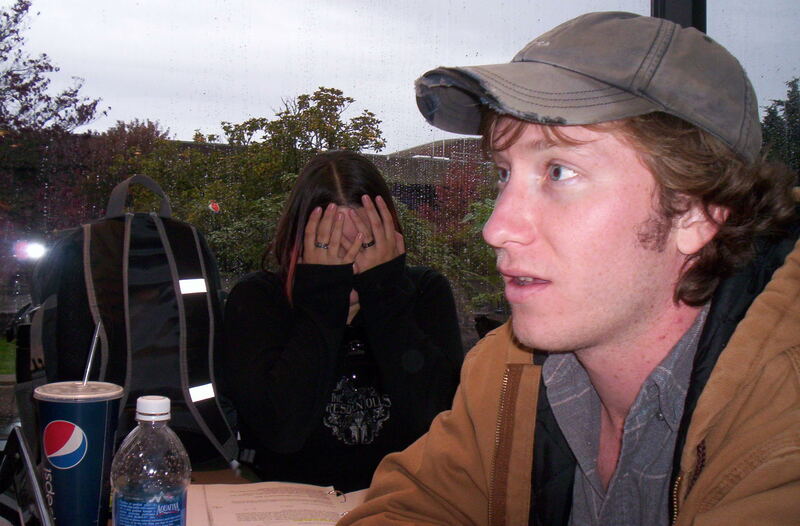 On the other side of the table, Brandon looks like he’s just seen a ghost, and Emma is afraid of the camera stealing her soul. Ha ha ha. This was in the hour before theater, when the theater people tend to congregate in the courtyard cafe and make Scrooge related jokes. This time they were frantically going over their lines, since yesterday was the off-book deadline. I didn’t really have trouble learning my lines. This was probably due to the fact that I really don’t have a lot of lines, only one monologue, and I grew up frantically memorizing Bible verses on Friday mornings at school so I could go out for first break. Oh he’s a tight-fisted had at the grindstone, is my old high school! Brandon: Scrooge has a cold in the head. Wait. Can you have a cold anywhere else? Emma: I have a cold in my hand! Alex: I have a cold in my foot! I made a habit of mocking Brandon by quickly memorizing this monologue he was struggling with. I actually only memorized the first part but at least it made me seem smart. The cold, I think, messed with something in my cranium, because all I can think about are lines from the play, running over and under each other in my head, in the middle and out again, round and round in various stages of affection, and all ending up in the wrong place. This entry was posted in Uncategorized and tagged A Christmas Carol, Bible verses, cold, courtyard cafe, friends, memorize, script, Scrooge, stone age camera, theater people. Bookmark the permalink.